The Chapada Diamantina National Park is one of the most fascinating natural parks of Brazil. The mountain scenery contains an extraordinary variety of ecosystems, from the arid Cerrado to the lush Mata Atlantica to the rocky terrain of the Caatinga. The bromelia and orchids find a welcoming environment, adapting themselves to the differences in climate and altitude. The mountain reach peaks of 1725m (5660 ft) – see route map, and offer shelter to the jaguatirica (local wildcat), puma, mocó (rabbit-like rodent), deer, teius (lizard) and seriema (long-legged birds). The pre-Cambrian period saw the beginning of the erosion of huge rocks made up of quartz which led to the formation of mineral towers known as “TEPUY” to the local Indians of the Maracas and Cariris – tribes that dominated the region before the arrival of the first settlers or bandeirantes, around 1750. The most impressive tepuis reach a height of 1472m (4,830 ft) and stretch across the municipalities of Palmeiras, Lençois and Mucugê. The Tabor hilltop, Calumbi, also known as Morro do Camelo, or Camel’s Back, the Pai Inacio and the Morro Branco do Paty, are living monuments and testimony to many local legends from bygone days. The towns that surround the Chapada Diamantina National Park are full of colonial buildings representing the architecture of the time, a sharp reminder of the opulence of the diamond era that help make Brazil the first global diamond producer at the beginning of the 20th century. The trails created by the garimpeiros (prospectors of precious minerals who mined by hand) are still accessible today for the enjoyment of hikers from around the world. It is still possible to encounter old garimpeiros who experienced and lived in the time of the diamond rush that made the area famous. The hidden rocks of the Chapada are the source of the principle rivers in the area. The Paraguaçu and the Rio de Contas rivers forge deep canyons in the hills and planes, creating vistas of incredible beauty such as the Fumaça Waterfall, at 400m (1400 ft) the highest waterfall in the country, and the caves of Iraguara and Poço Encantado. 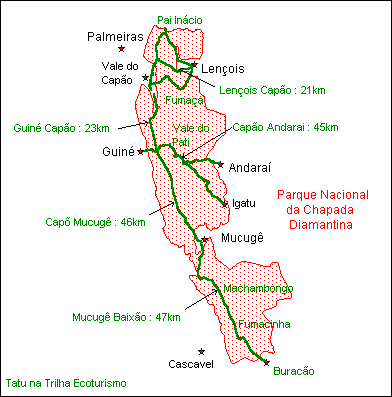 The Chapada Diamantina National Park was established in 1985 and is currently undergoing a process of implementation, administered by the ministry of the environment (ICMBio – Instituto Chico Mendes de Conservação da Biodiversidade), based in Palmeiras. For security reasons and to safeguard the environment, the local guide associations in the area should be contacted prior to undertaking treks within the park. Tourist agencies, pousadas, hostels and other groups offering community hosting can all recommend trips by bike, off-road, canoe and trekking on foot, as well as on horseback. Other attractions available include new age, spiritual discovery and personal development, including past-life regression and other esoteric activities. Information concerning roads and their condition for drivers that are new to the area. The following maps represent the different roads and their various conditions, the distance between the towns and the principle tourist attractions, gas stations and park borders, as well as the main trekking routes. The Brazilian travel guide, Quatro Rodas ( www.portaldaviagem.com ) is an excellent resource to explore the region in detail and it is regularly updated. The road from Palmeiras to Vale do Capão (Caete-Açu) presents some minor difficulties, but most vehicles will not have a problem and it takes around 40 minutes. The road that joins Abaira, Piatã e Boninal is in excellent condition until BR242, near Seabra. The road between Rio de Contas, Jussiape and Abaira is in poor condition and contains a lot of sand. In Jussiape, you can choose to go east to Mucugê where the dirt road is fine for driving and has sections with asphalt. The road that joins Lençois to Andorra is best attempted with off-road vehicles, with the rivers Roncador and Garapa being especially difficult to cross, depending on seasonal water levels at the time. As well as the roads above, mountain-bike lovers will find excellent roads and trails, inside and outside of the park, such as: Lençois/ Pai Inácio through Barrio Branco; Vale do Capão / Morrão; Pai Inácio / Morrão and Guiné / Capão. This regional map is only a guide as it is possible to walk hundreds of kilometres of trails inside the national park, although it is important to remember that the paths are not marked. Some sites can be reached without the help of a guide, but it is important to obtain the necessary information from competent individuals or organizations. Most of the park is not accessible by car and some areas such as those within the Pati Valley could be several hours walk from the nearest village. Climatic conditions can change very quickly, forcing changes to the trek’s itinerary. We therefore advise hikers to contract a guide or employ the services of a regionally based agency so that they can enjoy this wonderful area without taking unnecessary risks. The local agency Tatu na Trilha offers a variety of tours in the Chapada Diamantina that will enable you discover the region according to your individual needs and the time you have available. Several remarkable underground sites can be found in the Itaetê area in the southeast corner of the Chapada Diamantina National Park. Poço Azul and Poço Encantado are two underground lakes where, from September to March, the sun’s rays align to spectacular effect. The Poço Encantado is something of a victim of its own success and a visit at certain times can mean a long wait… However, the Poço Azul is easier to access and we can even take a swim there! It is possible to visit both sites from Lençois in one day but this can involve a 5-hour drive. A more relaxing option is to visit the poços in the day and then spend the night in the picturesque village of Igatu. The potholing caves or Speleological Park of the Iraquara, near Palmeiras, make up one of the most important subterranean networks in Brazil. The most visited caves are Lapa Doce, Torrinha, and Pratinha (usually overflowing with tourists). Many agencies in Lençois offer this tour in a single day, including a visit to the Pai Inacio mountain peak but we recommend caution when offered tours that seem attractive on price but risk compromising the quality of the experience by taking overly large groups. The cave of Torrinha was discovered several years ago by an association of French speleologists from Meandres and is currently maintained with great dedication and professionalism by Eduardo Martins, owner of the land where the caves are located. Three trails are offered to visitors, ranging from a basic overview to a full discovery tour (3 hours). The caverns have geological curiosities such as 60cm long gypsite ‘needles’, unbelievably large aragonite ‘flowers’ as well as other formations, well known to the local guides who are more than happy to share such wonders with those interested. Another little known site is the former underground diamond mine, unique to the Chapada and located in the village of Igatu near the larger town of Andaraí, itself worth a visit. This mine, known locally as “Brejo”, was previously equipped with a system of trolleys that were used to extract the ore which was then treated on the surface. The caretaker of this site is an actual ex-garimpeiro, Mr. Badega, who offers an entertaining and intriguing visit to this extraordinary place. The village of Igatu is comprised of an area of pousadas and restaurants and an older stone-built section inhabited by the population of prospectors whose stone houses seemed to gel with the local geology, creating a truly impressive maze of cyclopean stone alleys. The Fumaça Waterfall is a unique phenomenon, creating a landscape that is both majestic and spectacular. The water falls some 380m, second only to Salto Angel in Venezuela as the world’s highest. From May to September, there is less volume of falling water and the wind catches the water drops creating the smoky effect that gives this waterfall its name: “Fumaça”. The trail leading to the waterfall was created in the early years of the last century, in the age of of the diamond prospectors and garimpeiros, who settled in the basin of the rivers Capivara, Palmital, Capivari and Caldeirão. The trail was partly covered with rocks to facilitate access of cattle brought to the plains to graze during the drought season in the Sertão. The occasional fires that break out in these pastures are often deliberately started by cattle ranchers and have a strong negative impact on the local environment. The first part of the trek to Fumaça is a leisurely walk set against the fabulous visual panorama of the Rio Preto mountain range and the Capão Valley. After an hour you’ll fall in to a steady walking pace to enjoy the surrounding area, special for its rich and various flora of bromelia, orchids e cacti. The cattle that periodically descend on the trails are prevented from entering by the presence of a stone wall. After this wall, the trail turns into a pleasant walk on a plateau, with areas rich in carnivorous plants (Drosera) as well as plants engulfed by the ubiquitous Bromelia (Vriesas e Tillandsias). This region is known as the “Gerais”, an area that is home to a unique fauna, including local birds, monkeys, reptiles and passing felines: fortunate trekkers might find tracks of the local puma, supposedly extinct! It takes around 2 hours to get to the Waterfall. Arriving at the Waterfall is a truly uplifting experience. Breathe deeply and allow yourself to contemplate the mystery of creation, a special moment of unforgettable tranquillity and inner peace. The canyons, through which the rivers run, are a natural refuge for the small palm trees or palmitos of the dense Mata Atlântica (Atlantic Rainforest). After a long curve, the river flows into the Capivara, and continues downstream until it joins the Rivers São José and Paraguaçu. After the water falls from Fumaça it flows many miles all the way to the great bay, the Bahia de Todos os Santos. The Fumaça river converges with the Capivara river, culminating in São José, a tributary of the Paraguaçu, which runs all the way to the Bahia de Todos os Santos, and is blessed by the afro-Brazilian deities, known as “Orixás”. Point 1: A telecommunication tower marks the beginning of the trail where you can see a Brazilian Environmental Institute sign with information about the route and the park. After turning several rocky corners, you reach an open field, 300m long, which is the prelude to the Serra de Larguinha ridge. Point 2: Walking time: 20 mins. The hike is divided into three legs, containing some steep parts and reaching a maximum height of 330m. This is the most demanding part of the trail. The steepest areas have stepping stones to make it a little less strenuous for both people and local animals that feed on the pastures. Beautiful views can be seen of Morrão’s peak and the plains of Campina. You’ll find at your feet pieces of the local plant, Candombá, which can grow up to 1,200m and has a dense fibrous trunk, traditionally used to light campfires. The plant/tree can give us an indication of our altitude, and we can also witness quartz crystals (Si O2). This trail was originally opened by the garimpeiros who used it to reach the Palmital and Capivara rivers. Point 3: Walking time: 45 mins. At this point you reach the level of the first set of canyons; great rock faces trekking along a sandy trail with fantastic views overlooking Vale do Capão and Serra do Rio Preto. The trail then turns to the east, where you can see the valley basin. Point 4: Walking time: 1 hour. Fields of different rock types, both mineral-rich and fragile surround the basin. Watch where you are going and remember not to collect plants! The natural landscape with its rich biological diversity has many species of Bromelia (including a genus of the botanical family Orthophytum burle-marxii) as well as cacti and orchids, with over 30,000 samples per square metre. The vista is further enhanced by the presence of huge trees with dense foliage, such as pau de moco and Samambaia (Alsophila armata) that have existed in this area for millions of years. Points 5, 6,7 are stages where you lose sight of the gerais as the trek continues for 3kms, passing rivers (including the tributaries of the Fumaça) and experiencing exotic fauna and flora. Look out for the red, hairy plants: these are insect-eating carnivores (Drosera). The beautiful tie-like red flowers that you will see during your walk are also native to the Chapada (Augastes lumachellus). Close to the falls, it is easy to find a mocó (Kerodon rupestres) a small rabbit-like rodent but with short ears. Point 8: Walking time: 2 hours. Close to the river, you will begin to feel drops of water driven by the wind from the waterfalls that flank the mountains. This is the phenomenon that gave rise to the name, “Fumaça”, which literally means “smoke”. Take care if you suffer from claustrophobia start to feel dizzy. The abyss can play tricks with your subconscious and you are at an altitude of 380m. The woodland guiding you toward the canyons is a reminder of Mata Atlântica, with an abundance of palm trees (Juçara, Euterpe edulis). The Chapada Diamantina owes much of its aura to the waterfalls that appear amongst its reliefs. They are spectacular and provide a welcome opportunity for visitors and hikers to take a swim. Indeed it’s a rare pleasure to be massaged by torrents of water coming from above! We don’t swim under the Fumaça but on the way back hike we can make a small detour to visit the Riachinho Waterfall where it is possible to get directly under the cascading water and recover from the strains of the day. The same pleasure can be experienced under the Mosquito waterfall, also impressive for its sheer height and awesome setting. The Buracão waterfall in the south of the Chapada has eroded part of the rock to form a strange narrow path which we can descend to reach the lake at the bottom of the fall; a real aquatic sanctuary. The waterfall of Mucugezinho also known as Poço do Diabo (Devil’s well) is something of a misnomer since it provides a truly divine setting, surrounded by high natural walls and adorned with lush vegetation. The lake formed makes it possible to swim for over 80m, allowing you to reach the bottom of the waterfall and be purified by the water of the Mucugezinho River. It is also worth mentioning the Palmital, Encantada, Brejoes, Mandassaia, Rio Preto and finally the Purificaçao waterfalls for their charm, and natural beauty to be discovered by enchanted walkers in the sacred domain of Oxúm, the Candomblé goddess of fresh water! 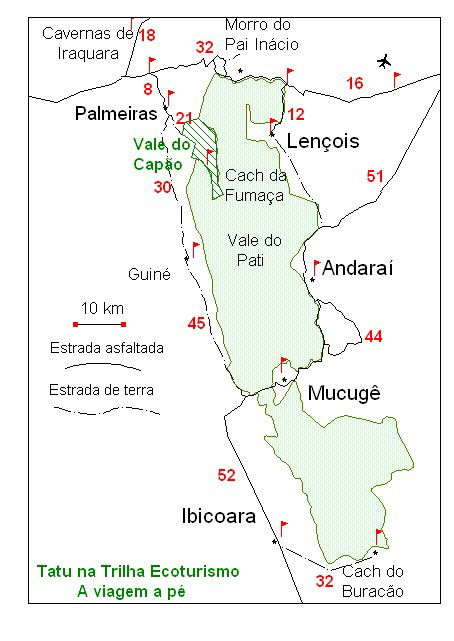 Capão valley, 50 km from Lençois, was a long time strategic base for diamond researchers working in the surrounding mountains between 1860 and 1930. The end of the diamond cycle saw the emergence of an economy based on coffee and banana plantations. The 1980s, which saw the arrival of people from larger Brazilian cities looking for a life closer to nature, has gradually transformed the valley. Several communities working with small scale farming and seeking a spirituality linked to nature blossomed whereas the 1990s brought tourism and new opportunities for all the residents. These communities successfully proposed courses of all kinds, ranging from natural medicine to shamanic retreats. Coupled with this a wider community movement is currently working on a sustainable development model that allows for the growth of the local economy while preserving the ecological and social balance of the valley. The choir, the circus school run by a Frenchman and the theatre group liven up the evenings in the village. Many Brazilian, South American and European artists have chosen to live there, giving the village something of a Bohemian feel, an easy-going atmosphere in which several different languages ​​can be heard. The village of Caete-Açu has adapted to these changes without losing its identity and Capão Valley can today count on over two thousand inhabitants. Accommodation in Capão: Pousada Tatu Feliz; Pousada do Capão; Pousada Lendas do Capão; Pousada Lagoa das Cores, Pousada Terra do Poente; Castelar Alvorada. The traditional town and capital of the Chapada Diamantina has a great wealth of hotels and travel agencies. Its colonial architecture and colourful streets provide a taste of bygone days where we can imagine the wealthier diamond prospectors strolling around in their linen suits. The buildings have been faithfully renovated and are now occupied by a variety of shops, especially in Rua das Pedras, the main shopping street where you can easily find somewhere to eat or drink during the evening. Two catholic churches, as well as the building of the former vice-consulate of France and the beautiful Garimpo Museum are the principle architectural landmarks of the city. Many artists and craftsmen have settled in Lençois and operate out of artisan workshops and there are a number of outdoor activity and extreme sports professionals as well as holistic practitioners and massage therapists. The ‘Associação Graus de Luz e Griô’ runs an arts-education project for local people from less-privileged backgrounds and has received numerous awards from UNESCO and other international institutions. Lençois also offers design workshops, handicrafts, computer courses, and boasts a vibrant cultural and development centre that is well worth visiting. The popularity of Lençois sometimes leads to a large number of visitors at the closer sites of interest, such as the Ribeirão do Meio, Sossego or Cachoeirinha so serious walkers often look further afield to enjoy the tranquillity of the Chapada. There are many trekking options: just ask an agency or a qualified guide. Some amazing walks originate in Lençois, such as the Lençois-Capão trek (5-6 hours walk), a day spent following in the footsteps of the mule trains which used to bring supplies to and from Lençois. The city livens up at the end of the day when visitors return to the town centre to enjoy the many bars and restaurants. Accommodation ranges from the simplest hostel to top quality charming hotels and pousadas, such as: Hotel Canto das Aguas; Pousada Vila Serrano; Hotel de Lençois, Pousada da Fonte; Pouso da Trilha; Estalagem Alcino. Founded in 1890 in the midst of the great diamond era, the quieter town of Palmeiras merits a visit for its beautiful colonial-style buildings, especially near the church square. The traditional Saturday market is typical of the region, with its leather craftwork and perfumed herbs, all brought on the backs of dozens of mules giving it a ‘wild west’ feel. The Palmeiras Carnival (February / March) is the only party for miles around and therefore attracts a large crowd of people from all over the Chapada. The development of the city is closely linked to the development of tourism within the Capão Valley while the national park administrative centre (run by IBAMA) is located at the entrance of the city. Lovers of anthropology will be delighted to visit the caves of Matão that are decorated with hundreds of drawings. It is possible to reach the southern Chapada town of Mucugê via a trail in fairly good condition that runs along the Esbarrancado mountain range and passes through the small village of Guiné (affording fabulous views from its natural vantage point). Banco Bradesco with 24h cash dispenser (Visa and Mastercard) is in the centre of Palmeiras. The town is synonymous with the search for diamonds that for many years led to thousands of prospectors settling or passing though, bringing the usual stories of thwarted ambition, decadence and subsequent decline. The arrival of the tourist trade has meant a return to a more balanced economy and many young people in the area now work as guides. The nearby village of Igatu, a few miles away, is undoubtedly one of the most exotic places of the Chapada with its ancient walls and cinematic caverns. It is possible to reach the Pati Valley from Andaraí, an area almost completely isolated, inhabited only by some twenty families with whom we can stay when exploring the valley. You can also visit the beautiful Marimbus wetlands, a treasure trove of fish and birdlife, a must see! The old ‘Santa Izabel do Paraguaçú’ town has preserved its provincial charm and at an altitude of 1000m enjoys a pleasant climate. The ‘Sempre Viva’ project combines a research centre with a fascinating museum where you can discover more about the self-sustaining (‘always alive’) species of flowers that have become the symbol of the region. The architecture, integrated into its rocky environment, is fascinating while the part of the museum devoted to the history of diamonds is particularly interesting and contains high quality authentic documents. Hiking enthusiasts will find many beautiful trails, including the climb up to Rio Preto. This small stone village located in the foothills of the ‘Serra do Sincorá’ is something of a throwback where little has changed in over a century. As façades of classic old houses remain where their roofs have long perished, Igatu stands like a Pompeii of the Chapada, defiant after the departure of the majority of its inhabitants. Its as if one can feel, while walking in these ruins, the turmoil that surrounded the profiteering in precious stone. The ‘Galeria Arte e Memoria‘ run by Marcos, brings together works by local artists and interesting artefacts from the diamond era. A 2-hour walk out of Igatu takes you to the Rampa do Caim, affording a sublime view of the meeting of the Paraguaçu and Pati Rivers. Small local restaurants built on cyclopean rocks offer cool local eating options. Looking for accomodation in Capão Valley?Have a look at Pousada Tatu Feliz’s rooms. In Palmeiras, shared taxis wait for passengers at the bus stop (except for the buses arriving at night) and take them to the Capão Valley on a 40 min drive, dropping them at Pousada Tatu Feliz, in front of the agency. Charge is R$15 per person each way (assuming the car is full). Purchase bus tickets directly on the site www.busbud.com/en in English; at the Salvador Bus Station (Rodoviaria) with either Real Expresso Company or Rapido Federal; or at the agency “Shopping Tour” inside ‘Shopping Barra’ mall, Barra district of Salvador. Its around €25 each way. We recommend purchasing tickets at least 24 hours in advance. We can order your tickets for you to collect at the counter of Real Expresso Company (on the first floor of Salvador’s bus terminal, where the ticket offices are) on the day of your departure. They will be given to you on presentation of your passports; it will be easier if you state: “já temos passagens reservadas”. The ticket price is then €33. You can buy your return tickets directly from the Real Expresso offices in Lençois or Capão. Outbound: bus to Palmeiras (at 05am, 1pm, 7pm and 11pm) then shared taxi to Capão Valley (R$15 approx, if full). • Chapada Diamantina – Boipeba and Morro de São Paulo. Take the BR 324 from Salvador to Feira de Santana, then the BR 242 to Palmeiras then follow 20km of dirt road to the Capão Valley. The journey takes around 6 hours.